Holiday treats to be beheld – not eaten! 1. 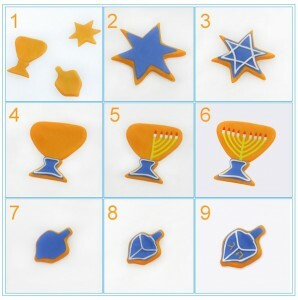 We start by making three different shapes like in the first picture, using orange Plasticine: a chanukiyah (a candleholder with nine candles), a sevivon (dreidel) and a Star of David, or Magen David. 2. Using the Star of David shape, cover the surface of the cookie with a thin layer of blue Plasticine for icing. 3. Add thin stripes of white Plasticine to the cookie. 4. For the chanukiyah, add blue icing to the base, then add white Plasticine stripes around the shape of the base. 5-6. Using yellow Plasticine, make the chanukiyah’s main stand, then add four curved lines to both sides of the main stand. Make candles from small pieces of white Plasticine and, for the top of the candles, create flames by using red Plasticine. 7-9. In the same manner as with the Magen David and chanukiyah, add blue icing to the top of the sevivon cookie and then white lines. Also, let’s add the letters on the dreidel, a nun, gimmel, hay or shin, for Nes gadol hayah sham, A great miracle happened there. Make a lot of cookies – but don’t eat them! Curly Orli and I hope that the cookies from this art project will help make your home even more festive. Happy Chanukah to all the readers of the Jewish Independent! Previous Previous post: Latke, latka: ‘cause it’s tradition!